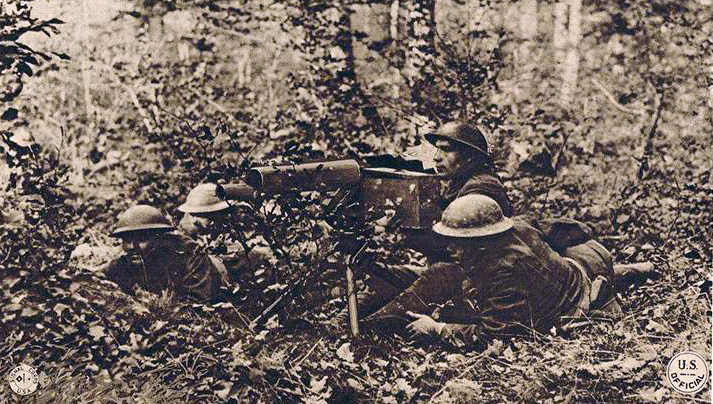 Machine gunners of the 80th “Blue Ridge” Division on the battlefield. National Archives. The Meuse-Argonne campaign, which lasted from September 26 through November 11, 1918, remains the largest and deadliest battle in American history. The 47-day offensive involved more than 1.2 million American troops, 26,000 of whom were killed, with nearly one hundred thousand wounded. 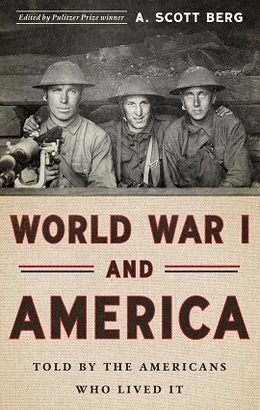 The battle concluded with the signing of the Armistice ending the war. We could hear the explosion as the shell left the muzzle of the Boche [German] gun, then the noise of the shell as it came toward us, faint at first, then louder and louder until the shell struck and shook the earth with its explosion. . . .
. . . No man can tell what surges through the heart and mind as you lie with your face upon the ground listening to the growing sound of the hellish thing as it comes towards you. You do not think, sorrow only fills the heart, and you only hope and pray. And when the doubly-damned thing hits the ground, you take a breath and feel relieved, and think how good God has been to you again. A little over two weeks later, Major Williams had an even closer brush with death, when a shell struck the rifle pit in which he crouched with the commanding officer of another battalion while planning the evening’s mission. He describes that experience in the following selection, which was published in Experiences from the Great War (1919). Notes: In the headnote, the acronym AEF refers to the American Expeditionary Forces. Major German H. H. Emory, who survived the attack described by Williams, was killed in action on November 1 near Sommerance. It was a hazardous move looked at from any point of view, but the triangle of wood in my left front was practically impregnable as the situation stood. . . . If you don't see the full selection below, click here (PDF) or click here (Google Docs) to read it—free!